An extraordinary collection of rare glass works from J. & L. Lobmeyr of Vienna, Austria, which dates from 1835 to 2008 and spans nearly the entire history of the firm will be shown through Jan. 2, 2011 at the Cooper-Hewitt, National Design Museum. The “Ted Muehling Selects: Lobmeyr Glass from the Permanent Collection” exhibition features more than 100 Lobmeyr pieces selected by designer Ted Muehling, original drawings lent by Lobmeyr, and other related works from the museum’s collection. One of the premier central European glass firms, J. & L. Lobmeyr was founded in 1822 and continues to deliver exquisite designs of high quality, execution and style. Celebrated for its clear, simple forms, many of the firm’s designs have been in continuous production since their introduction in the mid-19th century. Guest curator Muehling — a noted designer of jewelry and decorative arts, who has created his own designs in glass for Lobmeyr — brings a unique perspective and particular insight into the collection and has chosen works that celebrate the art of drinking and entertaining. The exhibition works are grouped by period, illustrating the timeless nature of Lobmeyr’s classic designs, which helped to influence the modern aesthetic. Lobmeyr is renowned for its innovative manufacturing and glass-making technologies, and for its tradition of commissioning notable designers and artists to work for the firm. Among the most significant works in the 163 piece Lobmeyr collection are designs from the Wiener Werkstätte and other early 20th-century designers, including pieces by Josef Hoffmann, Adolf Loos, Michael Powolny, Stefan and Marianne Rath and Josef Wimmer. The collection also features works by major 19th-century designers, such as Ludwig Lobmeyr and Josef Storck, as well as glass by contemporary designers. A highlight of the exhibition is glassware designed by Hoffmann, shown alongside a design drawing with handwritten notations by Ludwig Lobmeyr and Hoffmann, which illustrate the collaborative design process. Other work by Hoffmann from the museum’s permanent collection is also on view, including flatware, textiles and wallcoverings. • An 1835 wine decanter, designed by Josef Lobmeyr Sr.
• A “Blue, White, Gold” Footed Plate, designed by Lobmeyr circa 1885, featuring intricate hand-painted designs. 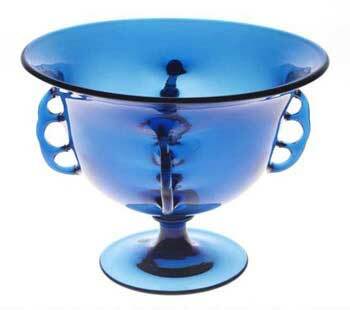 • The “Patrician Drinking Set #238,” which was designed by Hoffmann in 1917. • Viennese designer Marianne Rath’s flower bowl, which mixes blown and carved glass techniques to create the effect of rock crystal. The Smithsonian’s Cooper-Hewitt, National Design Museum is the only museum in the nation devoted exclusively to historic and contemporary design. Founded in 1897 by Amy, Eleanor, and Sarah Hewitt—granddaughters of industrialist Peter Cooper—as part of the Cooper Union for the Advancement of Science and Art, the museum has been a branch of the Smithsonian since 1967. The museum presents compelling perspectives on the impact of design on daily life through active educational programs, exhibitions and publications. The museum is located at 2 East 91st Street at Fifth Avenue in New York City. For further information, please call (212) 849-8400 or visit www.cooperhewitt.org. Browse through Morphy Auction catalog of Danielsen collection to see wonderful examples of rare postcards. Well-loved toys, family gifts, and small outfits from over 250 years of the British royal family.